Use the Special Event Multiple Model Release Agreement with Witness for commercial use of media which includes a recognizable person. Use this variation if the photographer is shooting at a private event that requires additional contractual obligations. For example, you may be shooting at an event that requires the photographer to sign a contract with the event organizers, which adds restrictions on the use of photographs taken, such as obtaining permission for each use of an image used commercially or publicly. Multiple people can all sign the same form. Some stock agencies require a witness signature. working with Proposal Kit was easy. Having used it for about 2 years it saved me a small fortune on attorneys fees. Keep up a great work." This Special Event Multiple Model Release with Witness is included in editable Word format that can be customized in Word or by using the included Wizard software. For valuable consideration received, I ("undersigned") hereby grant to Company Name ("Photographer") the absolute and irrevocable right and unrestricted permission to use, re-use, display, distribute, transmit, publish, re-publish, copy, or otherwise exploit, either in whole or in part, digitally, in print, or in any other medium now or hereafter known, for any purpose whatsoever and without restriction, photographs taken of me, or in which I may be included; to alter the same without restriction; and to copyright the same. Photographer agrees to use photographs in accordance with Insert event name here rules, regulations, restrictions and contractual obligations. Use this variation if the photographer is shooting at a private event that requires additional contractual obligations. For example, you may be shooting at an event that requires the photographer to sign a contract with the event organizers, which adds restrictions on the use of photographs taken, such as obtaining permission for each use of an image used commercially or publically. I understand and agree that Photographer may or may not use my name in conjunction with the photographs as he or she so chooses. I hereby release and discharge Photographer and his or her agents, representatives, and assignees from any and all claims and demands arising out of or in connection with the use of the photographs, including without limitation any and all claims for invasion of privacy, right of publicity, and defamation. I represent that I am over the age of eighteen (18) years and that I have read the foregoing and fully understand its contents. This release shall be binding upon me, my heirs, legal representatives, and assigns. 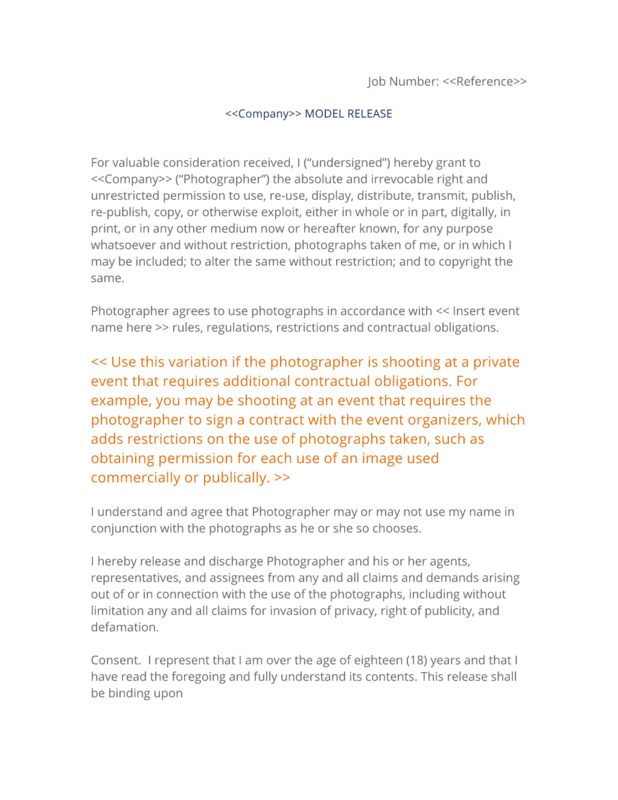 This Agreement shall be binding upon and enure to the benefit of Photographer and his or her respective successors and assigns, provided that Photographer may not assign any of his or her obligations under this Agreement without the undersigned's prior written consent. TIP: It can be easier to get people to sign your photo release if you use one release for everyone you are photographing that day or event. Fill in the first two lines with dummy names. This will help show people how to fill in their information on the following lines. The fact is that nobody likes to be the first person to sign the release; seeing other signatures on the page will encourage others to sign the release. This release is typically used when traveling and shooting stock photography on location. Some stock photo agencies require model releases to have a witness signature. The witness signature cannot be the photographer. Also some stock photo agencies require model releases if there are "contextual" identifiers in the photo (i.e. tattoos or other recognizable features) even if the model's face is obscured. The complete Special Event Multiple Model Release with Witness - with the actual formatting and layout - is available in this Contract Pack.